Announced alongside the EOS 750D (Rebel T6i in the US) and EOS 760D (Rebel T6s), the EOS M3 is shares many of the same features as its new siblings, including a 24.2-Mpix APS-C-sized CMOS sensor, a DIGIC 6 processor with a native ISO range of 100–12,800 (with expansion to ISO 25,600), and the Hybrid CMOS AF III system. This 49-point AF system has phase-detection pixels embedded in the image sensor to support contrast-detection AF, and covers a large area — approximately 75% of the width and 80% of the height of the frame. In addition, the EOS M3 has a substantial handgrip as well as a control dial (surrounding the shutter release), plus dedicated dials for shooting modes and exposure compensation. It also features a pull-out three-inch (1.04 million-dot) articulated touchscreen LCD, 4.2fps continuous shooting, and Full HD/30/25/24fps video, and built-in Wi-Fi with NFC. A tiny pop-up flash (GN 10 at 100 ISO) occupies the right-hand side of the top plate instead of a built-in EVF, though a clip-on 2.35-million-dot version (EVF-DC1) offered for the PowerShot G1 X II remains an option. Smaller and lighter than its Rebel siblings, the EOS M3 measures 4.3 x 2.7 x 1.7” / 11 x 6.8 x 4.4 cm and weighs 19.93 oz / 366g, body only. It is available now at 769 Euro, or around $870 for the body. 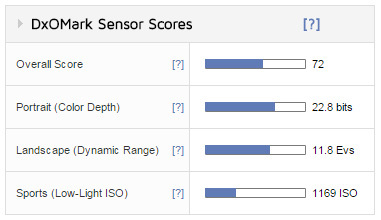 With an overall DxOMark sensor score of 72 points, the EOS M3 ranks, perhaps unsurprisingly, alongside the similarly-equipped EOS 760D and 750D at 70 and 71 points, respectively, as well as Canon’s higher-end EOS 70D (68 points) and EOS 7D Mk II (70 points) models. In addition to the increase in pixel count and the inclusion of the Hybrid CMOS AF III 49-point AF system, this new sensor still manages to comfortably outperform the earlier 18-Mpix unit (testing at 65 points) found in its predecessor and related models. However, while the sensor performance is very good, this sensor still isn’t a match against the current best-performing 24-Mpix APS-C sensors found in rival models such as the mirrorless Sony A5100 at 80 points and the A6000 at 82, as well as DSLRs such as the Nikon D5500 at 84 points. Not only do these models have class-leading sensor performance, they also compare favorably in price and features, particularly the two Sony mirrorless models. Although the EOS M3 is an attractive option and the sensor performance is very good, it’s up against some strong rivals, particularly the cheaper Sony A5100 and EVF-equipped A6000 models that share related 24-Mpix sensors. The M3 is also up against such models as the $700 Olympus OM-D E-M10 which, although it adopts a physically smaller-sized Micro-Four-Thirds sensor with a lower pixel count (16-Mpix), has a similar performance overall, albeit not directly comparable over the range of sensitivities. The Olympus has good color sensitivity and a relatively wide dynamic range at ISO 100-200, but it can’t match the Canon thereafter. However, it’s the Sony A6000 that is perhaps the M3’s closet rival, and it comfortably outperforms the M3 mostly by virtue of its lower noise floor at base ISO. This translates into a gain in low-light sensitivity of just under 0.3Ev and into higher color sensitivity, at least up to ISO1600, above which the Canon can match it. Similarly, the Sony has a wider dynamic range at base ISO of +1.3Ev, but again, this advantage is eroded by the Canon at higher ISOs. Rather weak results at base ISO compared with rivals adversely affects the overall sensor score, but Canon continues to perform well at high ISOs. As we’ve stated before in the reviews for the EOS 760D and 750D which adopt a related sensor, Canon has made worthwhile improvements over the previous generation 18-Mpix unit, but the still relatively weak results at base ISO continue to hold sensor performance back, at least when compared with the very best APS-C models. At high ISOs, the Canon sensor continues to impress, and its inclusion in the EOS M3 together with the other refinements in control layout and handling make it a compelling camera. 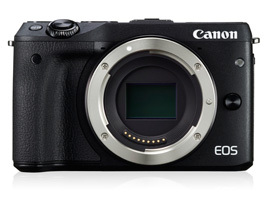 The lens range remains limited, but with the optional EF adapter and EVF, the EOS M3 looks like an attractive — if somewhat pricey — option for Canon users.